The novel tells the story of Demon Lord Satan and one of his generals who escape their home on Ente Isla through a gate to modern day Tokyo after a harsh and long battle with the Hero Emilia. It’s a comedy series based on how Satan, Maou as he’s known in Japan, and his demon general Ashiya make their lives in Japan after becoming trapped there and stuck in human bodies thanks to their loss of magic. They aren’t the only one’s there from Ente Isla either as Maou quickly discovers that the Hero Emilia, known as Emi in this world, has also followed them there to follow through on her mission of killing the demon king! Probably one of the most remarkable things about The Devil is a Part-Timer is that it’s telling what would normally be quite a boring story. A human working part time in their local fast-food joint? Not the most interesting subject on the planet, but the author also knows this and quickly steps up the fantasy side enough to balance things out nicely. A lot can be said for the relationship between Maou and Emi as well, as although the two are born enemies Emi doesn’t really know how to handle Maou as a human and thus doesn’t really want to kill him when he’s a powerless human. She also doesn’t really understand why Maou is instant on not causing chaos in Japan and doing his job so perfectly, it’s a complex subject to her but one the reader gets a lot of fun out of. The interactions between Emi and Maou always offer the comedy gold as the two really don’t like each other but can’t help to be drawn to one another because they’re both in a very similar situation. Of course Emi isn’t the only person Maou has befriended during his time on Earth, he’s also become close to a young girl at his workplace known as Chiho. Chiho as a character is a little bland but as the book goes on she proves she can hold her own and isn’t too fussed about Maou being the demon king. Emi too has made a friend through work, Rika, and it’s quite enjoyable to see how the two bond over time. It’s quite clear that Emi has never really had friends before, what with fighting in a war against demons as the chosen Hero, so coming to Japan has at least given her that. It’s a series that is probably the perfect example of a fun comedy mixed with nice fantasy elements. Magic, demons, heroes and the chaos bringing all these elements to Japan can cause makes for a wonderful mix and frankly The Devil is a Part-Timer knows how to mix all this perfectly. Even during a fight Maou and Emi are exchanging fun, annoyed, comments at one another and this all fits into the style incredibly well. Of course the translation does deserve credit here as it’s certainly a series that has been translated rather well to keep all the humour in, even if some of it might go over your head due to being slightly too Japanese. 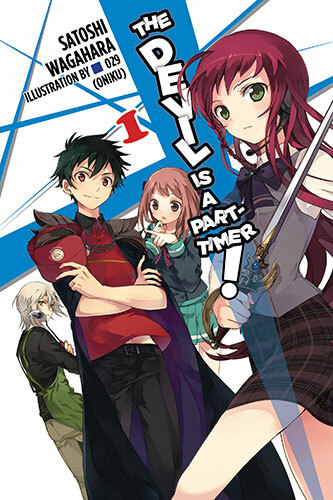 Overall it’s clear to see that The Devil is a Part-Timer has a great deal to offer in terms of characters and story and it really is just getting started. It brings something interesting to the English light novel scene which no other series really offers right now and I’m personally really looking forward to seeing where the tale goes from here.